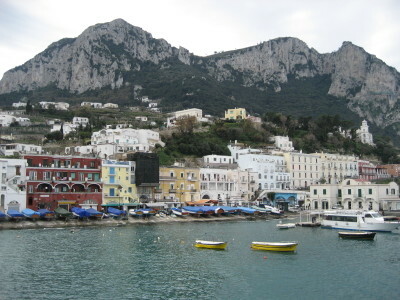 Our main activity today was to visit the Island of Capri, just a 30-minute ferry ride from the Marina Piccola in Sorrento to the Marina Grande in Capri. From the marina there is normally a funicular which transports you up above to Capri, however, it wasn’t running today, so we stepped next-door (to the right as you are pointing toward land) to a ticket counter where we purchased day passes for the bus (about 6,50 € each with a 1 € refund when you turn your ticket back in at the end of day - the funicular is included in this pass also). So we hopped onto the bus, where people were packed in like sardines, and arrived into Capri, where we ran to catch another less-crowded bus to Anacapri. 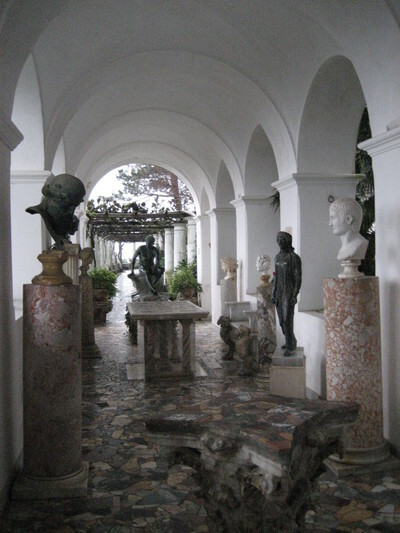 We expected Anacapri to be much less touristy, and it was. In fact, it was a little bit too untouristy today – finding an open restaurant for lunch proved rather difficult, and the one we did find open was not one we would rush back to. Of course, we should have anticipated this, being that it is Sunday, and the fact that it is February probably didn’t help either. 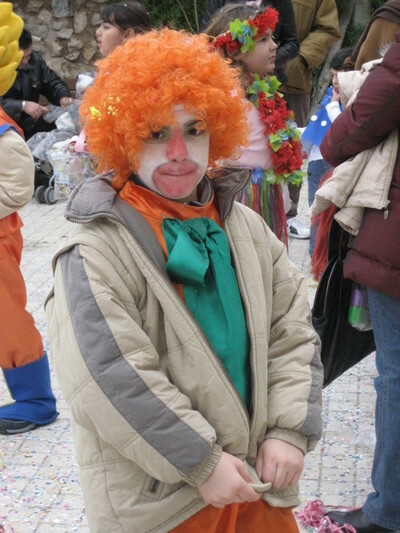 We ran into lots of cute children in one of the main piazzas, all dressed up in costumes and strewing colorful confetti, and spraying string foam all over the place and all over each other. We had seen this last year at the same time in Rome, and it finally occurred to us today (after seeing a large banner, framed with American flags, hanging above in the piazza) that they were celebrating Carnevale – the Italian version of Mardi Gras. We are curious to know what the American flags had to do with their celebration. 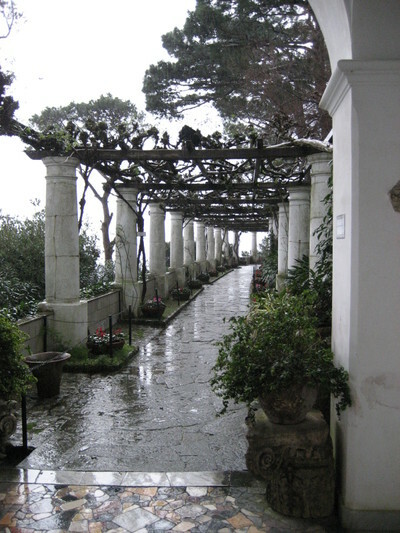 One of the highlights in Anacapri for us was taking the chair-lift up Monte Solaro where we enjoyed the panorama of the whole rugged island and the beautiful Bay of Naples – all under massive clouds. 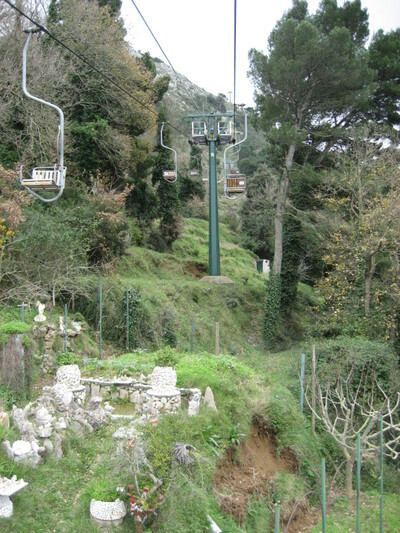 Instead of descending back the way we came, by way of the 15-minute ride on the chair-lift, we hiked down the easy rocky path, among the scrub brush, plants, and stations of the cross, stopping to take in the beautiful views, and we arrived at the bottom of the hill just before the rain started coming down. With our umbrellas keeping us from getting too soaked, we hiked over to the lovely 19th-century home of Swedish writer, Dr. Axel Munthe (1857-1949), who built the Villa San Michele out of the ruins of the Roman imperial villa of Emperor Tiberius, and wrote about it and other aspects of his life in his 1929 autobiography, The Story of San Michele. 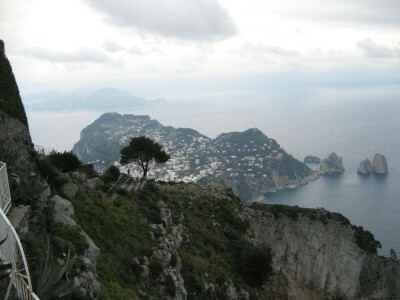 Next, we hopped onto another bus back to Capri. The bus trips were all a bit harrowing, along the narrow, windy roads, and I’m glad we were not driving. As it turns out, my understanding is that only the locals can bring their cars over on the ferry anyway, so there was no question of bringing a car over with us. 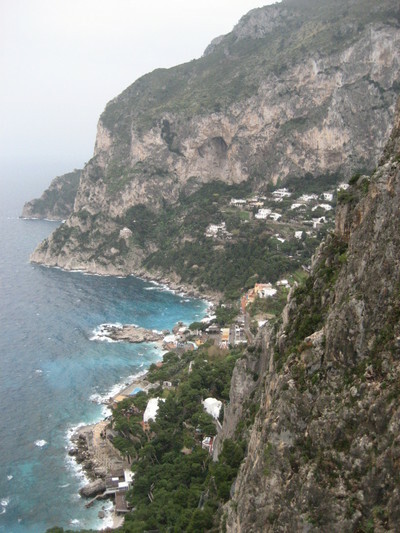 The tour boats were not running to the Grotta Azzurra (Blue Grotto) today because the sea was too rough, so we spent our time wandering around the streets and hiking up the hills of Capri in the rain. Our impression is that this is the best way to enjoy Capri, staying away from the areas overrun with tourists and tacky souvenir shops. We ended our day in Capri sipping icy limoncellos at a small marina bar, and watching the rain fall while waiting for our 6:00pm ferry ride back to Sorrento. Ohmigosh, Charlotte, where did you take that last photo? From the bus? I'm not good with heights. I mean, I barely made it past the chairlifts, and then this...whew! It's dizzyingly beautiful.